If you own a bird, then the odds are that your feathered friend has pooped on you at least a few times. While we can't blame birds for their little accidents, getting pooped on is hardly any fun, particularly when your nice clothing is involved! The comforting part about bird poop is that for the most part it doesn't stain clothing or anything else for that matter. Also, if your bird is healthy, bird poop doesn't smell. To be honest, it's pretty inoffensive and it's fairly easy to remove from anywhere that it doesn't belong. There is a reason bird poop doesn't smell. First, the avian diet is primarily made up of vegetable matter. When an animal eats meat, it tends to be smellier because meat protein is rich in sulfides. Sulfides are the component of meat that causes the smell. Another reason for the lack of odor is that the food passes quickly through the lower digestive tract and the poop doesn't have a chance to ferment. So, there is no opportunity for a smell to develop. Bird poop has three parts. The green component comes from the intestines and it is the feces. The white component is made of urates. This comes from the kidneys. The clear liquid portion is simply urine and also comes from the kidneys. It all comes out of the only lower opening that the bird has: the cloaca. The components come together to form a swirled blob that is really inoffensive but can be inconvenient. It is especially inconvenient when you have just gotten yourself ready to head out the door and discover that you have some bird poop on the back of your shirt. You could always change your shirt, but there are ways to simply remove it and go on with your day. Let the poop dry. Trying to remove wet bird poop from your clothing will most likely result in a bigger mess, as fresh bird poop tends to smudge on fabric. For the easiest removal, let the poop dry completely before attempting to remove it from the clothing. Pluck, then scrape. Once the poop is completely dry, use a paper towel or napkin to pry the largest pieces off of your clothing. Sometimes, the poop will come off in one large piece. If there are smaller pieces of dried poop left behind on the fabric, scrape the area with the edge of a credit card until the remaining solid waste flakes off. Wipe down the area. After all of the solid waste has been removed, many times you will be able to see a light colored spot where the droppings fell. This is the remnants of the dried urates from the poop. To remove this spot from clothing, dab and wipe the area with a damp cloth for a few minutes. A microfiber cloth works wonders for this purpose as it doesn't leave any lint on the area you are attempting to clean. This should help to remove any remaining waste that is visible. Once the area is dry, it should be very hard to tell that you ever got pooped on at all. Unless you potty train your bird, you will likely face bird poop again. 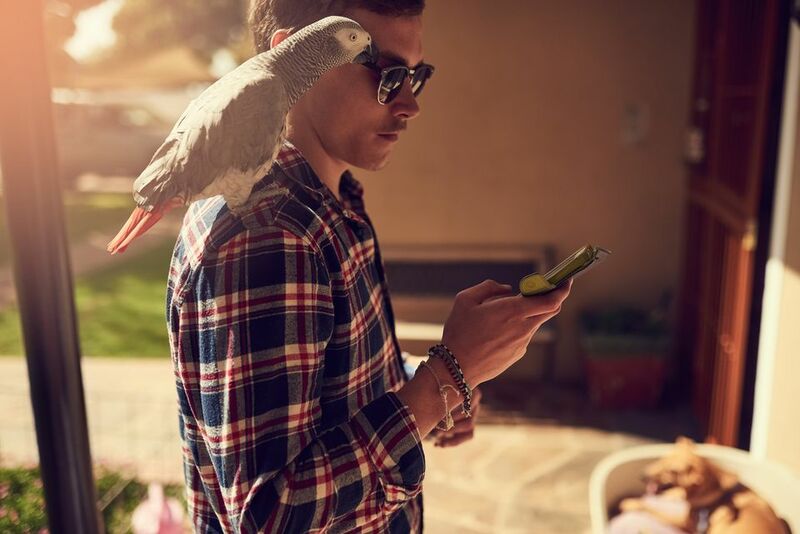 Keeping these tips in mind will help you keep your clothing spot-free and in good shape next time your feathered friend mistakes that new shirt for a target.